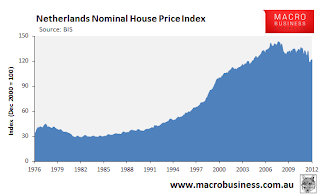 More than a decade ago, the Dutch central bank recognized the dangers of [the housing] euphoria, but its warnings went unheeded. Only last year did the new government, under conservative-liberal Prime Minister Mark Rutte, amend the generous tax loopholes, which gradually began to expire in January. But now it's almost too late. No nation in the euro zone is as deeply in debt as the Netherlands, where banks have a total of about €650 billion in mortgage loans on their books. The Netherlands is still one of the most competitive countries in the European Union, but now that the real estate bubble has burst, it threatens to take down the entire economy with it. Unemployment is on the rise, consumption is down and growth has come to a standstill. Even €46 billion in austerity measures are apparently not enough to remain within the EU debt limit. Although [Dutch Finance Minister and Euro Group Chief] Jeroen Dijsselbloem has announced another €4.3 billion in cuts in public service and healthcare, they will only take effect in 2014. "Sticking the knife in even more deeply" would be "very, very unreasonable," Social Democrat Dijsselbloem told German daily Frankfurter Allgemeine Zeitung, in an attempt to justify the delay. Note how Dijsselbloem is ready and willing to stick austerity measures of any kind on every other eurozone economy but his own. The Australia Macro Business blog picks up the story in Dutch unemployment surges as house prices fall. Earlier this month, I posted on how the Netherlands was facing a potential economic crisis on the back a severe housing correction, whereby house prices fell by -8% in the year to December 2012 to be down -18% since prices peaked in 2008, pulling many Dutch households into negative equity (see next chart). The release of labour force data overnight suggested the Netherlands’ economy has deteriorated further, with Dutch unemployment increasing to 8.1%, a level not seen since the 1980s, with job losses most accute in the building industry (see next chart). The jump in unemployment follows the contraction in the Dutch economy, whereby GDP has contracted by -1.2% over the past year (see next chart). The sharp deterioration in the Dutch economy is placing pressure on the central government to abandon austerity measures, which it has pursued for the best part of two years and is partly responsible for the contraction in demand. As noted, the hypocrites want austerity for everyone but themselves. Regardless, the Netherlands economy is headed for a much sharper contraction as is France. Simply put, the entire eurozone is in deep trouble even as the nannycrats insist the worst is behind. Ironically, the best is indeed ahead, and the best is a breakup of the eurozone.